The Beginning of The Era of the Moviegoer!!! THE BATTLE IS ON!!! 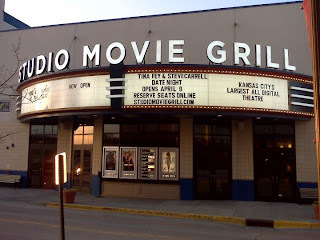 I mentioned a few posts ago about the Studio Movie Grill....or maybe it was on Facebook that I mentioned it. Regardless, this is a new theater that has opened in Zona Rosa....a mere one-half mile from the AMC Barrywoods, which currently accounts for about 80% of my moviegoing. This just in.....GET READY TO RUMBLE! I have many friends that work at AMC by nature of my attending 150 plus movies a year. I like those folks, but my primary allegience lies with myself. I hope severely that (1) the SMG being the sole exhibitor for several upcoming BIG movies (2) their wider variety of specialty flicks (PLEASE, PLEASE GO VISIT: http://www.horrorremix.com/) and (3) the fact that they offer real-meal food....will all add up to better prices and offerings from both movie houses! As a side-note, I know for a fact that AMC Barrywoods will not being carrying MacGruber or The Killers straight out of the gate. Who knows what else will fall to the other side of Barry Road....but, enough about that, but I will keep you posted as there are new developments! 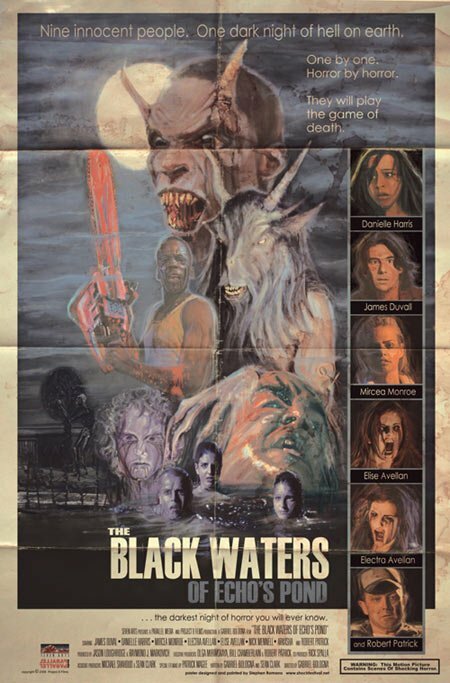 The Black Waters of Echos's Pond is seemingly an Indie horror flick that is quite ambitious at its core, but was lacking....something...I just couldn't put my finger on it. I will say my overall impression was one of enjoyment, but primarily because of the hokeyness. How hokey you ask? 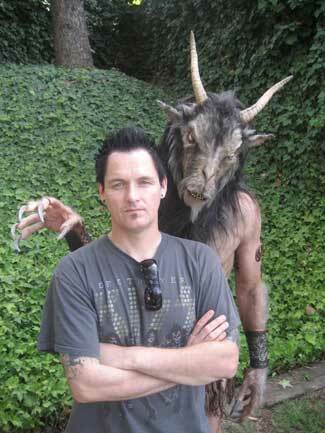 Well pictured here with producer and co-writer Sean Clark is our main evil-doer, the Greek God Pan. Seen in this publicity shot with Smith here...in complete daylight and for all to see, this is as masked as the costume gets throughout the feature. During the worse than so bad its good opening, we see a fleeting glimpse of ol' Pan. It is his game of temptation and truth that fuels the plot forward and in each shot throughout the movie, you see more and more of this Willow-era quality costume. We've come a long way from Willow and I wish the filmmaker here had pulled more of a Jaws/Spielberg situation....less monster for more suspense scares. 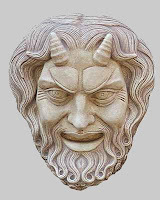 Even the island's guests, as they took turns taking on the spirit of Pan, shift to a clownish-like mask of black goo. Well Robert Patrick takes a turn a the country bumpkin, island owner and primary inhabitant. Holey Shamolely....what is the T-1000 doing in this? Ol' Agent Doggett has to eat too, I guess. I say all that tongue-in-cheek, mostly because I applaud the filmmakers for making this movie. They have done what I would love to do, but lack the drive to really, really try....make a movie. A decent, watchable movie in which Gabriel Bologna (the co-writer, director) is reaching quite a bit, but I didn't hate myself for seeing it. The Bounty Hunter suprised the crap out of me...I was expecting what has become stan dard Gerald Butler RomCom flub. I got a vague feeling of "Fletchery" while watching this. Not a direct Fletch feeling, but just in a roundabout way, which made this in my opinion, more of a guy's version of a chick flick, than a straight-up chick flick. The concept of this movie is fairly basic and everywhere you would expect a joke, it delivers. The upside is that in addition to the ball-punching slipstick antics, there is some witty dialogue as well. I think this would be great as a date movie or as a standalomne for all you lonesome moviegoers out there (don't worry, I include myself in that group as well!). Well as I am tyoing, my eyes are growing heavy...I'm outta here for the night. To avoid shennaigans, I will save it and dole it out to you tomorrow. 1) Jean Claude Van Damme screwed the pooch big time by passing on this. It looks fantastic for what it is and Sly proved with the most recent Rambo that he can direct action. 2) They spoiled two major cameos by featuring them in the trailer! W.....T......F......!! Why would they do this? This would have been a great opening night moment and it is done. I won't spoil who it is here, but just know if you watch this trailer, you will see two actors who had not been previously listed to be in this flick. Whoa! 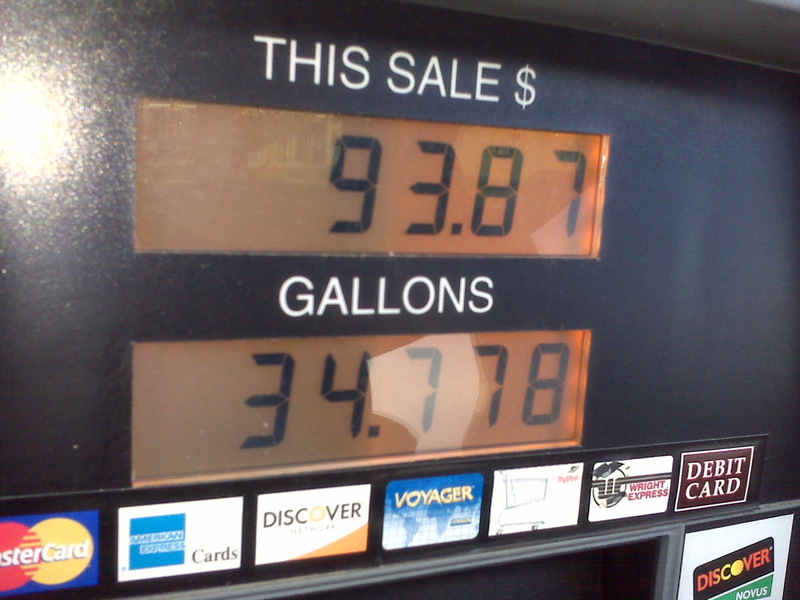 Now that is An Inconvenient Truth! Yep, that's gas for my truck...my work truck that is, thank goodness! As many of you know, in addition to being the Reel Rhino, I actually work as a Crime Scene Investigator. In my jurisidiction of employ, we saw a pretty violent murder this week that had me driving all over our county for the better part of the weel. In addition to working Crime Scenes, I actually do a fair amount of teaching CSI as well. This week saw a our very intense, very intensive investigation AS WELL as a trip towards central Kansas for as one-day lecture on CSI for a law enforcement training seminar. 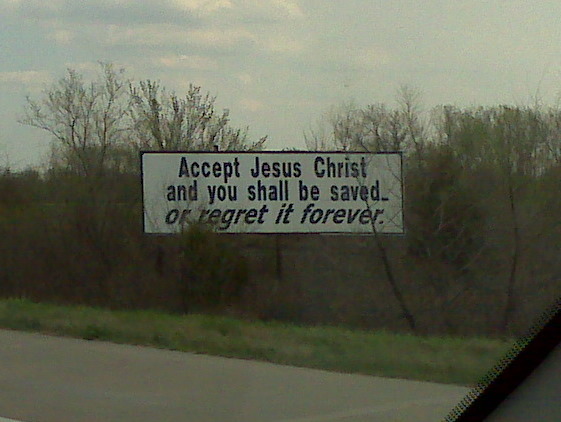 I had never been to EMPORIA, KS but I can tell you it was quite a one-day Journey. 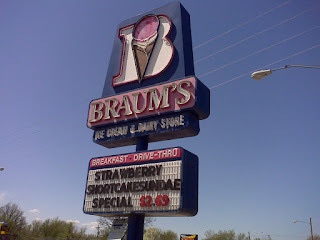 Thanks to my friend Dustin, I was introduced to Braum's. I had no idea it would be a chain, but it sure is. Another friend, Chris, recommended it for the ice cream, but we happened to make it into town to catch some biscits and gravy before our class began, and I did not go for the breakfast ice cream. My intention was to swing back through and catch some FroYo before we left town, but it didn't happen....quite unfortunately! Kansas City has frozen custard, which is great, but we are decidedly short, and sadly I might add, on frozen yogurt. Braum's was great and the one day conference went very well. 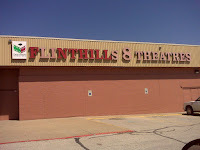 At lunch, I was jonesing for something movie-related, so we went cruising down by the mall and I at least got to snap some photos of the outside of their theater, the Flinthills 8 Theaters, operated by Dickinson Theaters, at the Emporia Mall. Yes, it looks a little rundown, but at least it's something! Some folks have the dream of getting to every ballpark to catch a baseball game, or to hit the nations highpoints, getting to the highest elevation point in each state. I even have a friend who, why I do not know, is only the state of Alaska away from having run a marathon in all 50 states. People do crazy things. I have never thrown a single movie stub away (yes, that too is crazy!) I love the concept of going to a movie in all 50 states. 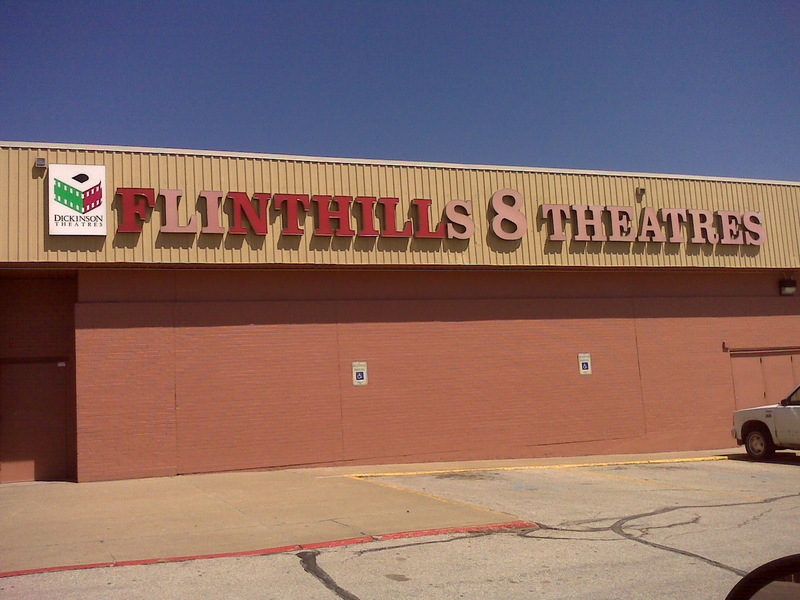 When I go to a new town, I always like to find the theater, if not just to see how folks in that area seek out their entertainment. Maybe one day I will be able to chase my 50 state movie dream. The great thing about doing anything is all 50 states, is there is always Hawaii and Alaska in that mix! Emporia was interesting. On the ride back, we got to see an example of the very conservative billboards that are posted throughout the great state of Kansas. This is just an example, but there are also interesting signs on abortion, stay-at-home mom's, and how state-run health care will lead to the decline of modern society. I think an asset of mine is that I believe what I believe and I don't think that any of my views are so correct, that they desrve to be billboarded to herald my message! Maybe I am being too contradictory as I sit here typing. In addition, we also drove by a controlled burn that had gotten just a little bit out of control. Nothing makes you feel more California than a fire burning along side the highway. A wacky wacky trip without a doubt! More to come, very soon! I plan on writing this weekend on The Ghost Writer as well as an out-of-nowhere wide-release, The Black Waters of Echo's Pond as well as a very interesting offering available at our newly opened Studio Movie Grill in Zona Rosa. THE REEL RHINO checking in folks! 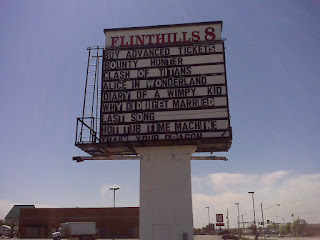 I hope everone had a great movie-going week....I know I did! On that note, I think I have made my ruling...I think that the general picture quality of the Real-D is actually BETTER than the IMAX 3-D. I am still holding out judgment on the Real-D vs. Disney 3-D debate, but for now, Real-D is for me. I think it is mighty convenient also that ALL of the 3-D vendors have agreed and have commenced a planned 20% ticket price increase in 2010 on all 3-D shows. NEW YORK (CNNMoney.com) -- Ticket prices will be going up at movie theaters across the country this weekend as the entertainment industry looks to cash in on growing demand for 3-D movies following the success of "Avatar" and "Alice in Wonderland." Starting Friday, prices for adult admission to 3-D movies will increase an average 8.3% at box offices nationwide, according to market research conducted by investment firm BTIG. Ticket prices for IMAX movies are expected to jump 10%, while prices for regular 2-D movies will rise about 4% on average. At one AMC theater in New York, the price for a family of four to see a 3-D screening of Dreamworks Animation's "How to Train your Dragon" this Friday will be $63 before popcorn, soda or candy. 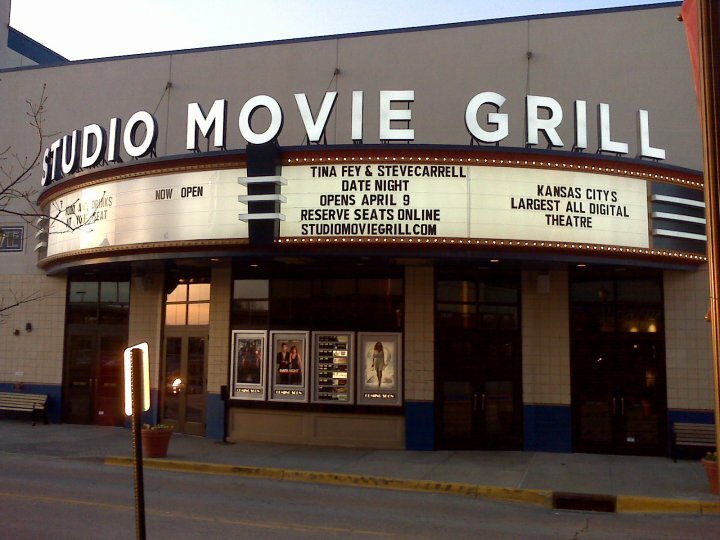 A spokesman from AMC declined to comment, and Regal did not immediately respond to a request for comment. "These are major prices changes for an industry that has historically instituted gradual prices increases," said BTIG analyst Richard Greenfield. Greenfield said the price hikes reflect a growing belief among theater owners that consumers are "hungry" for 3-D content and are willing to pay more for an enhanced movie-going experience. Box office sales nationwide are up nearly 10% so far this year, due in part to the record-breaking success of 3-D blockbusters like "Avatar" and "Alice in Wonderland." Gray warned that 3-D technology has come and gone in one form or another over the last five decades, and the current popularly could prove to be nothing more than another fad. Much of the success or failure of this year's 3-D fare will depend on the quality of the story, he added. "If consumers absorb the price increases without issue, we believe it bodes well for the pricing power of the movie exhibition industry, particularly their highest quality product," Greenfield said. Personnally, I think the whole moviegoing affair needs to be revamped in favor of the moviegoes in terms of pricing, accommadations, AND more respect paid by all to the movie-going environment. I mean...really? 3-D goes up $1 per ticket at AMC....that's a 20% increase...AND...they have raised concession prices again. There will be a tipping point, but when? High prices at the theater really help foster piracy as well. I know they are not directly related, but there is some cause in the high price of entertainment. Welll back to my midweek movie go....How to Train Your Dragon was an absolutely fun ride! It was 3-D done right and animation seems to be the place for 3-D, that is unless your name is James Cameron! I had no intention on seeing this movie and the timing and opportunity played its role to guide me to it. I will say, HTTYD was a sworn enemy of mine due to the whoopin' it laid on Hot Tub Time Machine Last week. I must say, that holding one against the other is an unfair comparison, but this really is a stellar flick! 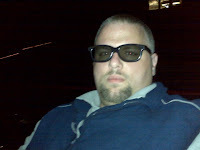 The Real-D 3-D was eye popping and seemless and the aerial scenes were great! The story was much better than I ever would have imagined, and this was by far, the best use of Craig Ferguson to date, Also, I made a comment a few weeks ago about my belief that Jay Baruchel didn't have the ability to carry a flick....well he might nor be Tom Cruise just yet, but I think he held his own and did a great job. I think he was hilarious in Tropic Thunder and I do think he will have a bright future. I was not impressed with his portrayal of the '5' in She's Out Of My League. The REEL RHINO says: 4.5 horns! Let me start by saying that there were TWO...count 'em TWO crying babies in the theater throughout my Clash of the Titans show (ALSO REAL-D). Typically, the crying baby problem ruins my movie-going day. I was completely taken out of Drag Me To Hell (although I loved that flick anyway!!) and I was pulled out of this one too, but not as much since most of the action drowned out the crying. 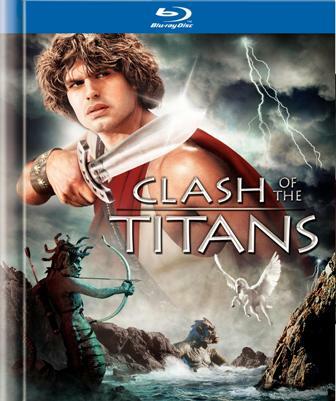 Let me also say that I absolutely LOVE the 1981 Clash of the Titans. Ray Harryhausen's stop-motion animations/puppetry was a beautiful kind of art and the original Clash had loads of character. I also grew up a child of the 80's and I remember very much watching this movie with my Dad shortly after we first got cable. The original Clash became a cult classic but it tried to exist in 1981 as something more. Sir Laurence Oliver played Zeus, Ursula Andrews (aka the ORIGINAL Bond Girl) played Aphrodite, and even Professor McGonagall (Maggie Smith) had a role. 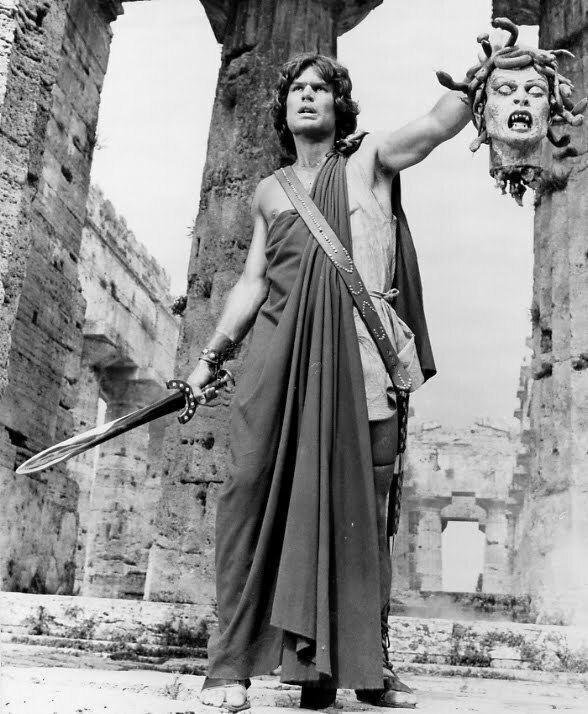 Harry Hamlin, aka Mr. L.A. Law, was Perseus...is it too touch to reference the 80's with the 80's? Hamlin also more recent roles in Veronica Mars and Harper's Island, as well as voicing Perseus in God of War II. The 2010 edition is being unfairly criticised for being "too modern"....some are saying that this version loses the kitschiness of the original by taking out the Harryhausen and dropping in CGI and 3-D.
Let me say that I believe it to be blatently apparent that Louis Leterrier was paying homage to the original. In addition, to say that the 2010 edition is all show and no story, I say WHATTTTT!!! It is Clash of the Titans! It is not Shakespear! It holds true to some the outlandish story components of what made Greek and Roman mythology the wild adventure it actually is. All in all, I really enjoyed this....the Real-D was great and the effects in general were great. 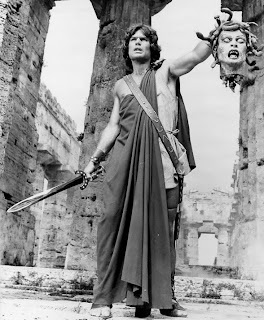 It was evident that Ray Harryhausen was not a part of this effort, but many people who were cared as much as the 1981 production crew and it showed on screen. Defy the so called critics...go see this flick. It is a fun movie that is also "pretty" to watch. What more could you want for an afternoon at the movies!